Those familiar with the exhibits at David Zwirner remember Doug Wheeler’s amazing “Into the Heart of Lightness” last year. Similar to Wheeler’s piece where the gallery space is defined by light, Diana Thater in her current show uses light to immerse the viewer into the world she has crafted. Thater’s “Science, Fiction,” focuses on the relationship between the dung beetle and the milky way and in part the human relationship to the stars, skies and nature. “Science, Fiction” features three new videos by Thater. 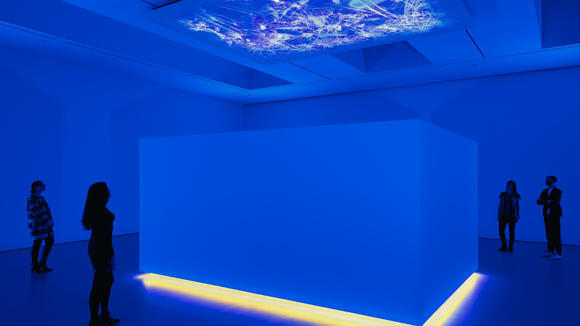 The exhibit is divided into two rooms engulfed in blue light. The first room, features two videos of the milky way, which the artist recorded from a telescope at the Griffith Observatory in Los Angeles. This room, leads into another blue lit room. The second room of the exhibit features an inclosed projector that projects a video of the dung beetles onto the ceiling of the gallery. Recents studies revealed that the dung beetle is the only insect known to use the milky way to orient itself at night, and Thater’s setup is meant to mimic the studies performed.